In ancient times, people of many cultures thought that the universe consisted of only their own locality, distant places of which they had heard, and the sun, moon, planets, and stars. Many people thought that the heavenly bodies were gods and spirits. But the Polish astronomer Nicolaus Copernicus suggested in 1543 that the earth is like the other planets and that the planets revolve around the sun. Later astronomers showed that the sun is a typical star. The development of the telescope, the photographic plate, and the spectroscope (an instrument that analyzes light) led to a great increase in know- ledge. Astronomers discovered that the sun is moving within a system of stars known as the Milky Way. 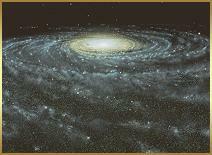 About 1920, astronomers realized that not all of the patches of light seen in the night sky are part of the Milky Way. Rather, many of these objects, called nebulae, are other galaxies. The Big Bang Theory provides the best explanation of how the universe came to be. According to it, the universe began with an explosion – called the Big Bang – 10 billion to 20 billion years ago. Immediately after the explosion, the universe consisted chiefly of intense radiation and particles. This radiation, along with some matter, formed a rapidly expanding region called the primordial fireball. After thousands of years, the fireball consisted mostly of matter, largely in the form of hydrogen gas. Today, faint radio waves coming from all directions of space are all that remain of the radiation from the fireball. In time, the matter broke apart into huge clumps. The clumps became galaxies, many of them grouped into clusters and superclusters. Smaller clumps within the galaxies formed stars. Part of one of these clumps became the sun and the other objects in the solar system. The best available evidence indicates that the galaxies will move apart forever. This evidence and the universe's current rate of expansion indicate that the present age of the universe is about 15 billion to 20 billion years. This estimate agrees with astronomers' observations of the oldest stars in groups known as globular star clusters. Astronomers do not rule out the possibility, however, that all the galaxies will come together again in about 70 billion years. This would happen if the universe contained more of a yet unobserved substance called dark matter than the matter that is seen in galaxies. The gravitational pull of the dark matter would slow the expansion. All the material in the universe would eventually collapse, then explode again. The universe would enter a new phase, possibly resembling the present one. The search for dark matter is a major area of research.